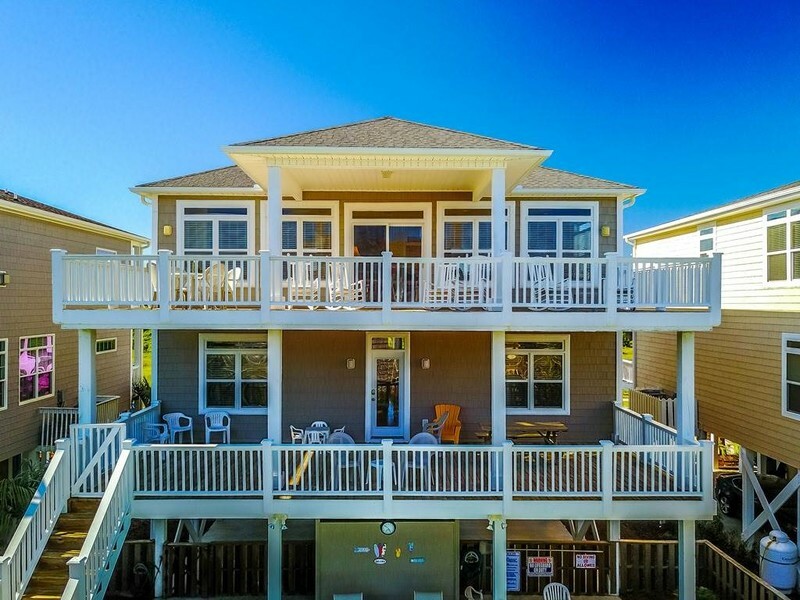 5 Bedroom, 5 1/2 Bath beautifully maintained vacation home. Convenient beach access. Reverse floor plan. From the top floor, spend your time on the expansive, covered porch or sundeck with peek-a-boo views of the Atlantic Ocean. From the north side of the home, watch the sunrise as boats pass by in the Intracoastal Waterway and the occasional deer crosses the maritime woodlands. The kitchen is open, spacious and well-stocked for meal preparation and socializing. The large dining tables comfortably seat up to 16 plus 4 stools at the eat-in kitchen bar. On the top floor, you will also find a half bath and one of the two master suites with a king size bed. The master bathroom offers floor to ceiling tile shower. On the first floor of the home, 4 bedrooms are nicely positioned, each with a private bathroom. On the north, street side of the home, bedroom 2 is considered the “kids room” with 2 bunk beds; bedroom 3 offers a queen bed and 1 bunk bed. On the south side of the first floor, bedroom 4 has 2 double beds and bedroom 5 is the second of two master bedrooms with a king size bed and private bath with floor to ceiling tile shower. Retreat to the covered porch on the first floor to take in the ocean breezes and overlook the private swimming pool. Additional amenities include: Linen service provided - all beds will be made and towel sets for each occupant, WiFi, Televisions in 5 bedrooms plus living room, 2 DVD Players, Outside hot/cold shower with dressing room, private swimming pool, and charcoal grill. Non-smoking and no pets. We had a wonderful time. The house was clean, spacious, and perfectly suited to our family. Precious memories were made this week!